NIA CHARLESTOWN NEVIS (August 06, 2016) — The four Youth Parliamentarians who represented Nevis at the 40th Commonwealth Parliamentary Association (CPA) Caribbean, Americas and Atlantic Region’s Conference in Tortola from July 26 to August 01, return to Nevis on August 01, with the Best Orator (Government) Award. Rol-J Williams, a student of the Gingerland Secondary School who was part of the delegation from Nevis, coped the Award at the 11th Regional Youth Parliament Conference. He was honoured for his achievement by President of the Nevis Island Assembly Hon. Farrell Smithen and Premier of Nevis Hon. Vance Amory, at a brief ceremony at the Assembly grounds on August 05, 2015. Mr. Amory congratulated Williams on his achievement and commended him for being a good ambassador to Nevis. Meantime, Mr. Smithen praised the students for their performance during the Conference. He said they debated on the topic: “The involvement of youths in the decision making in parliament”, in which Tassai Pemberton and Shanai Liburd served as Opposition members and Rol-J Williams and Joanne Manners served on the Government side. “Overall, the Youth Parliamentarians from Nevis have performed to a very high level and one has got to give credit where credit is due. “They performed well and I indicated to them before they left Nevis, that they were ambassadors for Nevis and I was convinced that they did do justice in terms of their presentation,” he said. 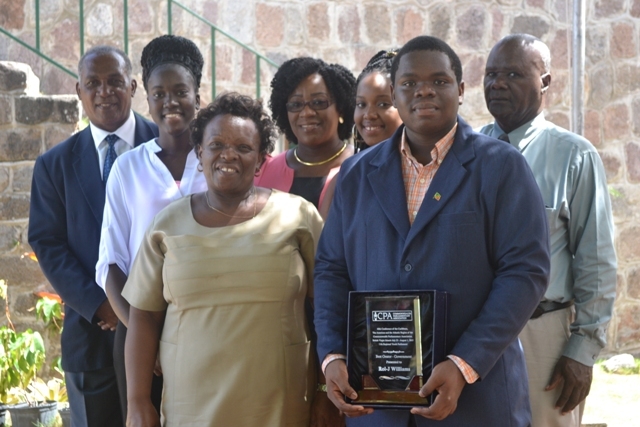 According to the Clerk of the Assembly Shemica Maloney who chaired the ceremony, Rol-J was presented with a plaque by the organisers in recognition of his oratory skills. “We are pleased to announce that our delegation did exceptionally well. We are proud of them and we are happy that Rol-J was able to bring home an award for Best Orator from this conference,” she said. The Clerk of the Assembly also noted, that Pemberton who is a student of the Charlestown Secondary School, was also recognised as being the youngest youth parliamentarian to participate in the 2015 Conference. The Nevisian Youth Parliamentarians were among 22 delegates who took part in the 2015 CPA Conference. Maloney used the opportunity to thank the sponsors whose efforts facilitated the youth parliamentarian’s travel to Tortola and participation in the 2015 Conference.